Times are still good for small manufacturers. Demand is strong and most companies are busy. If a small manufacturer isn’t making money in this environment, something is wrong. At the same time, it’s important to know that manufacturing imports are at an all-time high. 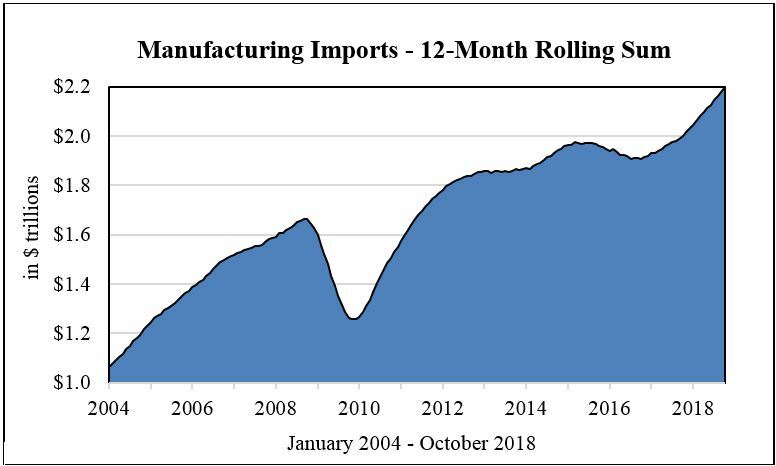 For the year ending 10/31/2018, the value of manufactured goods imported into the U.S. was $2.2 trillion (the highest 12-month value ever recorded). It also marked the highest annual growth rate (9.9%) since early 2012. How could this be, you might ask. Well, the hot U.S. economy is driving demand, there is little open capacity in most of the domestic manufacturing sector, and the Dollar is strong. So imports are relatively cheap and purchasers need to buy more inputs. This creates a dangerous situation for small manufacturers. In such an environment, sometimes you simply can’t supply all of the parts your customers want when they want them – you don’t have the people, and/or you don’t have the capacity. Some customers may well turn to a foreign supplier for the additional parts they need. Really, what choice do they have? This means new low-cost competition, where even a long-time customer could potentially re-source all of your parts. At any time. If not this week, next month or next year – whenever the economy slows. Or maybe the customer will just make you match his new foreign supplier’s price to keep his business going forward. That’s all. Times are still good. But as soon as demand weakens, there will be consolidation. Switching will occur. And much of this will be to foreign suppliers. (Of course, this is already happening to some small manufacturers in the region. But we ain’t seen nothin’ yet.) Dangerous times, indeed.